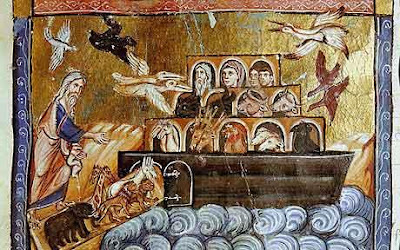 The claim last month by a team of Turkish and Chinese evangelical explorers to have found Noah's Ark has been met with skepticism by the scientific community. The 15-member team announced that they were 99.9% certain that the structure they located 4,000m up Mount Ararat in eastern Turkey (2nd image) is the biblical ark. 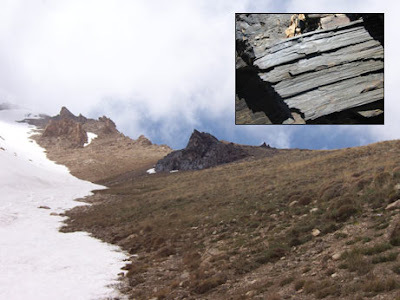 The wood fragments and other specimens (3rd image), found well above the vegetation line and the altitude settled by humans, have been carbon-dated to an appropriate 4,800 years ago. A creationist scientist takes issue with that date, reasoning that the wood should test at tens of thousands of years, if the 60,000-year limit of radio-carbon dating is to be extrapolated to match the believed 6,000-year age of the earth. 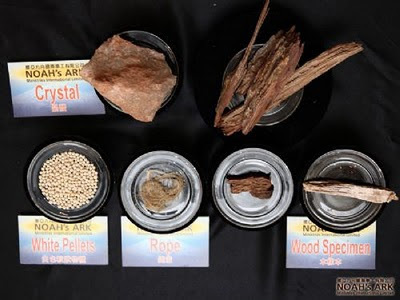 In addition, he says that any wood from the ark would be unlikely to remain in place because it would be quickly scavenged as building material after the vessel came aground. Other scientists say that the textured pattern the evangelists claim to be petrified wood is actually consistent with sedimentary rock. And scholars point out that the Bible doesn't identify on which peak in Turkey the ark landed, and that nobody associated Mt. Ararat with the ark until the 10th c. B.C. Despite searches dating back to the 4th c., no definitive scientific proof of the ark has been discovered. The Christian Science Monitor reports that a former member of the Turkish-Chinese team suggests the discovery is a staged hoax. I asked my friend and follower Kent Schnake for his opinion, and he replied that he is very cautious about believing in artifacts such as Noah's ark, although he would really like it to be discovered. "In general, I believe that Biblical history (as opposed to the books of poetry and prophecy) can be taken literally," writes Kent, "but I do not depend on confirmations of such things as the basis for my faith." If archaeologists - evangelist or otherwise - are searching for the ark, perhaps they should be looking for something other than a compartmentalized wooden rectangle, since a newly translated Babylonian tablet reads that Noah's ark was in fact round.